MEDICOMP Medical is pleased to announce our newest product MC-4425 Universal Dual Swivel with Straps. This product was developed by request to replace the Kendall Argyle™ (Trademark of Sherwood Services AG) 15mm swivel connector REF 8888246009 which had been discontinued by the original manufacturer. Our company was contacted by a medical professional who had done an exhaustive search for a replacement and asked if we would be interested in manufacturing this unique swivel adapter. After months of research and testing we were able to produce the previous discontinued product. It has been well received by medical professionals, patients, family and care team members. Being especially important to the SMA population the MC-4425 swivel adapter also has numerous applications which are utilized in both the hospital and home care environments. Smooth design reduces friction points on the skin making the adapter especially useful for patients with fragile skin integrity, such as those encountered in neonatal, pediatric and geriatric populations. Trach ties can be used with the included straps to make holder adjustable. Adapter is very flexible and allows for a great deal of movement by the patient without added torque from the patient. SMA (Spinal Muscular Atrophy) is a disease that deprives people of physical strength by affecting the motor nerve cells in the spinal cord, taking away the ability to walk, eat or breathe. It is the number one genetic cause of death for infants. Check out curesma.org for more info. 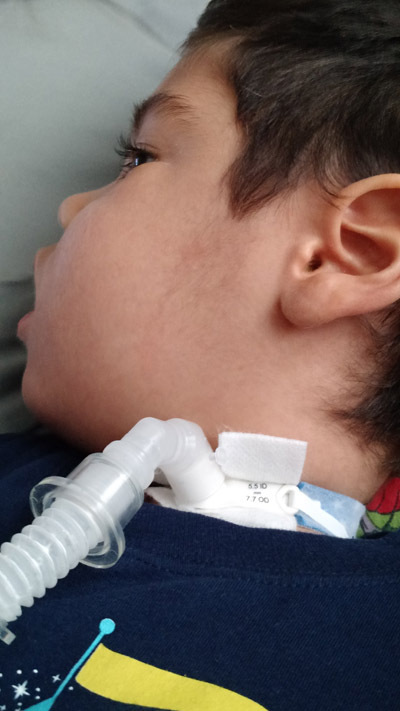 I feel that your Medicomp MC-4425 trach swivels for attaching the vent circuit for easier repositioning and comfort are the best on the market because they have not produced skin breakdown on my 5 year old client. They fit tight enough not to fall off on their own yet they are easy to grab off and remove for emergency suction and cough of my client. They have “ears” or knobs that will secure the swivel to the trach during travel yet not irritate the skin due to their rounded nature. It also gives me great confidence that the young boy that I care for is receiving all the respirations from his ventilator correctly as you have assured me that your swivel has been leak tested and does not leak. This reassures me that the pressure and settings on the vent remain safe and effective for his airway and lungs. Thank you for your great customer service and reaching out to me after my inquiry. Thanks for stepping up to the plate and making an excellent product. Since 1989 MEDICOMP has been designing and manufacturing critical care medical devices and systems in the fields of Anesthesia, Intensive Care systems, Respiratory Medicine, Neonatal Intensive Care Units (NICU), and the specialist applications systems market. Our devices have met the needs of hospitals, long-term care facilities, surgery centers, respiratory clinics and nursing homes throughout the health care system continuum. MEDICOMP's manufacturing facility is located in Minnesota and our company distributes our devices and systems to respiratory specialty suppliers throughout North America as well as exportation to suppliers in countries internationally. These equipment products were developed with the assistance of professionals in their respective fields of health care. By listening to your opinions, suggestions, and new equipment ideas, MEDICOMP will continue to be the primary manufacturer and provide quality medical equipment and service you would expect while consistently delivering value, quality, and performance. At MEDICOMP we strive to be the best provider of Bacterial Filtration Efficiency Filters, Viral Filtration Efficiency Filters, and Heat Moisture Exchange Filters. We are the number one resource for BFE Filters, VFE Filters, and HME Filters for hospitals and alternative care environments. MEDICOMP filtration products help improve the outcome of the respiratory patient both in the hospital and alternative care environments.